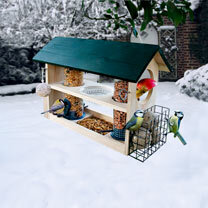 With seven feeding stations and a water bowl, this deluxe bird feeder offers every bird species its favourite food! The open construction enables direct access to the food. Simply fold the roof open to fill. Includes: tray for seeds, feeding column for peanuts (6cm diameter), skewer for apples, hook for grease, grating bag, wire bag for raisins, bowl for flour meal and water bowl. 27 x 42 x 19cm. Mesh width 0.6 x 0.6cm.